The magical light from Te Ramaroa mountain first guided Kupe into Hokianga Harbour. 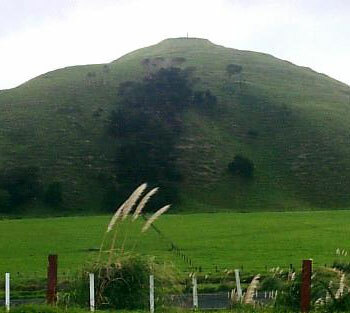 Many other sacred mountains support the house of Ngāpuhi, a people who played a central role in Māori history. Ngāpuhi is the largest tribe in New Zealand. Their territory stretches from the Hokianga Harbour to the Bay of Islands, and to Whāngārei in the south. Arriving in the Matawhaorua canoe, the navigator Kupe named the Hokianga Harbour. After he returned to Hawaiki, two captains, Nukutawhiti and Ruanui, set off again to establish settlements in New Zealand. The tribe's founding ancestor, Rāhiri, was descended from Kupe, Nukutawhiti and Puhi. When his two sons fought over land, Rāhiri helped them make peace by flying a kite over the territory. The points where it landed marked the boundary between their two regions – Hokianga and Taumārere. All tribes north of Auckland are descendants of Kairewa and his wife Waimirirangi, ‘the queen of the northern tide’. Through his marriages, Rāhiri forged links with many tribes. Some descendants moved eastward, taking over other groups. Eventually the name of Ngāpuhi was given to all tribes in the Hokianga and Bay of Islands. Using muskets gained through trade with Europeans, Ngāpuhi defeated several tribes in the ‘musket wars’ of the 1820s. Ngāpuhi chiefs signed both the Declaration of Independence in 1835 and the Treaty of Waitangi in 1840. But in 1845–46, after chief Hōne Heke protested at growing British control, Ngāpuhi fought the British to a stalemate. Later they lost much land. In 2013 there were more than 125,000 Ngāpuhi people, and more than 50,000 lived in Auckland. Their central organisation is Te Rūnanga ā-Iwi o Ngāpuhi. Renowned descendants include Dame Whina Cooper, who led a land march in 1975.